GB Tell me why you chose your ring. 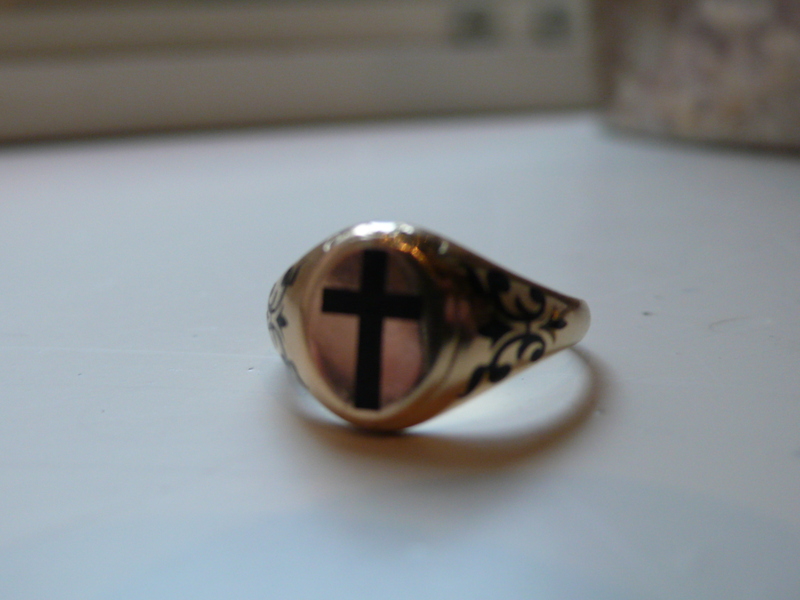 LT I found this ring when my friend went to get his girlfriend a present in an antiques shop. It just jumped out at me, then the woman who owned the shop told me that it’s a Georgian poison ring made for killing people secretly by opening up the top of the ring, putting poison in their drink then closing it again. Then later the use was changed and there’s a lock of someone’s hair inside. It might be for luck or for someone who died. I like the black pattern on the side and the cross and the way it’s quite mysterious. I couldn’t stop thinking about it. I went back two months later and it had been sent to auction but the woman managed to get it back for me. Now I wear it every day except when I’m skateboarding. I know some people find it spooky but I think it’s been turned into something good. GB Are you religious? It has the cross on it. LT Well I have a nice life so I believe that someone’s looking out for me, even if it’s not necessarily Jesus. GB Is that enamel on the sides? LV Yes. I have a couple of friends who are jewellers who say it would be hard to get this made now. It’s so delicate and it’s survived 260 years. It’s seen a lot of history. GB Does the age of it make it more beautiful to you? LV Yes I do think about the hands it must have been through. Even if it was new I’d still love it but I don’t think it would look like this if you tried to make a new one. The hinges, everything would be different. GB Do you think there’s beauty in skateboarding? LT Yes of course! It’s the most beautiful thing ever! Style is beauty and style’s the most important thing. Some people just have it. They might not do the best stuff but they’ll always go down in history for their style. I think that’s why skateboarding is so respected. It’s a hard thing to do and to make it look graceful. It’s all tied to great artists and musicians and even the clothing is important. LT I like something that has a bit of substance. If something is beautiful but has a story behind it, that makes it perfect beauty for me. A beautiful looking thing that has a good story behind it will be beautiful forever.